“Abruzzi” redirects here. For other uses, see Abruzzi (disambiguation). 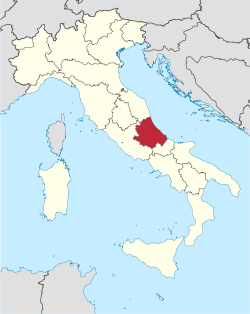 Abruzzo (pronounced [aˈbruttso]) (Abruzzese: Abbrùze, Abbrìzze, Abbrèzze; Aquiliano Abbrùzzu) is a region of Middle Italy, with an area of 10,763 square km (4,156 sq mi) and a population of 1.2 million. Its western border lies 80 km (50 mi) east of Rome. 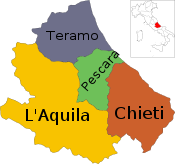 The region is divided into the four provinces of L'Aquila, Teramo, Pescara, and Chieti. Abruzzo borders the region of Marche to the north, Lazio to the west and south-west, Molise to the south-east, and the Adriatic Sea to the east. Geographically, Abruzzo is divided into a mountainous area to the west, which includes the Gran Sasso d'Italia, and a coastal area to the east with beaches on the Adriatic sea. Abruzzo is considered culturally, linguistically, historically, and economically a region of Southern Italy, although geographically it may also be considered central. The Italian Statistical Authority (ISTAT) deems it to be part of Southern Italy, partially because of Abruzzo's historic association with the Kingdom of the Two Sicilies. Abruzzo is known as "the greenest region in Europe" as almost half of its territory, the largest in Europe, is set aside as national parks and protected nature reserves: there are three national parks, one regional park, and 38 protected nature reserves. These ensure the survival of 75% of Europe's living species including rare species, such as the small wading dotterel, golden eagle, the Abruzzo (or Abruzzese) chamois, Apennine wolf, and Marsican brown bear. Abruzzo is also home to Calderone, Europe's southernmost glacier. The Abruzzo region has two types of climate that are strongly influenced by the Apennine Mountains, dividing the climate of the coastal and sub-Apennine hills from the interior's high mountain ranges. Coastal areas have a Mediterranean climate with hot dry summers and mild winters and rainy hills with a sublittoral climate where temperatures progressively decrease with increasing altitude and precipitation with altitude. Precipitation is also strongly affected by the presence of the Apennines mountain ridges of the region increases with the proportion being more abundant in the field and on the slopes exposed to the west, instead of decreasing towards the east and east-facing slopes. Often the Adriatic coast are sidelined rainfall from the west to the barrier effect of the Apennines undergoing the action of gentle winds descending from it (or Libeccio). The minimum annual rainfall, however, are found in some inland valleys, sheltered from much disturbance to the blocking action of mountain ridges, such as the Peligna Valley, or the valley of the river Tirino, which in some places (Ofena, Capestrano) showed barely 500 millimetres (19.7 inches), and not along the coast where it never falls below 600 millimetres (23.6 inches), for if Teramo is relatively little watered by rain (Teramo less than 800 mm), the metre is exceeded in Chieti, reaching maximum levels in the Adriatic, while between Ortona and Vasto in Costa dei Trabocchi decrease again. The highest rainfall occurs in upland areas on the border with Lazio; they are especially vulnerable to Atlantic disturbances. Around 1,500 to 2,000 millimetres (59 to 79 inches) of precipitation is typical (Pescara in 2010 showed a value close to 2800 mm). The natural parks of the region include the Abruzzo National Park, the Gran Sasso and Monti della Laga National Park, the Maiella National Park and the Sirente-Velino Regional Park, as well as numerous other natural reserves and protected areas. In the past decade, tourism has increased, in particular concerning internal and European arrivals. Abruzzo is world-famous for its wildlife parks (Abruzzo National Park, Gran Sasso and Monti della Laga National Park, Maiella National Park) and regional park (Sirente Velino), and 38 protected areas between oasis, regional reserves and state reserves. The inland mountainous region contains several ski resorts, and coastal tourism is also well-developed, in particular the Trabocchi Coast, a very picturesque stretch of coastline known for the ancient fishing machines that can still be seen by tourists. Abruzzo's wealth of castles and medieval towns, especially around the town of L'Aquila, has earned it in some quarters the nickname of "Abruzzoshire", by analogy with the "Chiantishire", nickname sometimes used to refer to the Chianti area of Tuscany, but Abruzzo is still off the beaten path for most visitors to Italy. Although the population density of Abruzzo has increased over recent decades, it is still well below the Italian national average: in 2008, 123.4 inhabitants per km2, compared to 198.8. At the province level, the density is varied: as of 2008 Pescara is the most densely populated with 260.1 inhabitants per km2, whereas L'Aquila is the least densely populated with 61.3 inhabitants per km2, although it has the largest area. After decades of emigration from the region, the main feature of the 1980s is the immigration from third world countries. The population increase is due to the positive net migration, as since 1991 more deaths than births were registered in Abruzzo (except for 1999, when their number was equal). In 2008, the Italian national institute of statistics ISTAT estimated that 59,749 foreign-born immigrants live in Abruzzo, equal to 4.5% of the total regional population. Motorway A14 Bologna – Taranto known as the A14 "Adriatica", includes 743 km (461.68 mi) of road, including lengths in the cities of Bologna and Taranto. Opened to traffic in 1965, it is now a major tourist infrastructure, running through the coastal towns of Emilia Romagna, Marche, Abruzzo, Molise, and Apulia. Abruzzo is the infrastructure in question, including the toll road of South Broad and Val Vibrata, which marks the border between the Marche and Molise. Regarding the links, the A14 meets the SS16 and the SS652 Bottom Sangro Valley near Broad and SS80 in Giulianova. Before the earthquakes Abruzzo was the region with the highest number of castels and hill towns, but still today it holds many of Italy's best-preserved medieval and Renaissance hill towns that rival those in Umbria and Tuscany. Abruzzo boasts indeed twenty of The most beautiful villages in Italy, 2nd only to Umbria which has 22. These awards are not just for aesthetic beauty but also are for art and culture, historical importance and livability. The abrupt decline of Abruzzo's agricultural economy in the early to mid-20th-century saved some of the region's most beautiful hill towns from the onslaught of modern development. Many lie entirely within regional and national parks. Among the most well preserved are Castel del Monte and Santo Stefano di Sessanio, which lie in the Gran Sasso National Park on the edge of the high plain of Campo Imperatore and nestled beneath the Apennines' highest peaks; both hill towns, which were ruled by the Medicis for over a century-and-a-half, have relatively little tourism. Between the two towns sits Rocca Calascio, the ruin of an ancient fortress popular with film makers. Both Monteferrante and Roccascalegna are two best-representing Abruzzo villages in the province of Chieti. Within the Gran Sasso National Park is also found Castelli, an ancient pottery center whose artisans produced ceramics for most of the royal houses of Europe. Civitella del Tronto played a crucial role in the history of the unification of Italy. The fortress of Civitella is today the most visited monument in the whole Abruzzo region. Other medieval hill towns located fully within Abruzzo's park system are Pacentro in the Maiella National Park and Pescasseroli in the Abruzzo National Park. Pacentro, which features a 14th-century castle with two intact towers, has been little touched by modernization. The Shrine of Gabriel of Our Lady of Sorrows, in the province of Teramo, with average of 2 million visitors per year is one of the 15 most visited sanctuaries in the world. Capestrano, a small characteristic town in the province of L'Aquila, is the hometown of Saint John of Capistrano, Franciscan friar and Catholic priest, as well as the namesake of the Franciscan missions San Juan Capistrano in Southern California, the mission Mission San Juan Capistrano (Texas) and the city of San Juan Capistrano in Orange County. ^ "Eurostat – Tables, Graphs and Maps Interface (TGM) table". European Commission. 12 August 2011. http://epp.eurostat.ec.europa.eu/tgm/table.do?tab=table&init=1&language=en&pcode=tgs00003&plugin=1. Retrieved 15 September 2011. ^ "EUROPA Press Releases – Regional GDP per inhabitant in 2008 GDP per inhabitant ranged from 28% of the EU27 average in Severozapaden in Bulgaria to 343% in Inner London". Europa (web portal). Archived from the original on 12 February 2012. https://web.archive.org/web/20120212013333/http://europa.eu/rapid/pressReleasesAction.do?reference=STAT%2F11%2F28&type=HTML. Retrieved 2013-10-08. 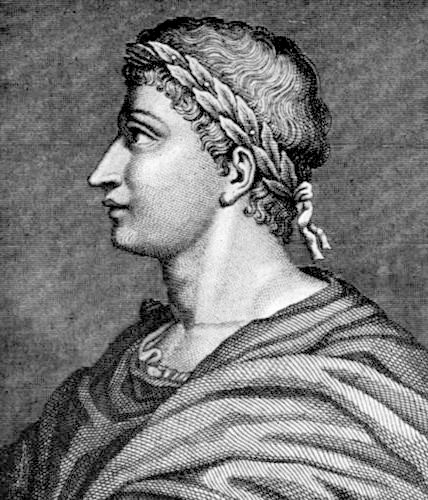 ^ a b Paradosso evidenziato da Ignazio Silone, cfr. Costantino Felice (2010). "Quadri ambientali e identità regionale". In Donzelli. Le trappole dell'identità: l'Abruzzo, le catastrofi, l'Italia di oggi. Rome. p. 41. ISBN 978-88-6036-436-4. https://books.google.it/books?id=KmB44oQjNcC&pg=PA85. ^ "Laquilacapitale". Archived from the original on 15 February 2015. https://web.archive.org/web/20150215170952/http://laquilacapitale.eu/it/abruzzo-regione-verde-europa.html. ^ "Parco Nazionale d'Abruzzo Lazio e Molise – Natura – Fauna". http://www.parcoabruzzo.it/pagina.php?id=46. ^ "I parchi in Abruzzo". http://www.abruzzoverdeblu.it/?id=9. ^ "Abruzzo: Forte e Gentile, definizione di Primo Levi, giornalista e diplomatico, nel sito di vastospa". Archived from the original on 2 September 2012. https://web.archive.org/web/20120902210345/http://www.vastospa.it/html/vastesi_nel_%20mondo/abruzzo_forte_e_gentile.htm. ^ a b "WineCountry.it Abruzzo wine region of Italy". winecountry.it. http://winecountry.it/regions/abruzzo/. Retrieved 8 October 2009. ^ "Italy Guide: Abruzzo Region". Comuni-Italiani.it. http://en.comuni-italiani.it/13/. ^ "ABRUZZO". Archived from the original on 1 February 2014. https://web.archive.org/web/20140201215720/http://www.abruzzoturismo.it/img/depliant/en_AmbienteNatura.pdf. ^ Sam Dunham (2008-08-17). "Abruzzo Annual Weather Forecast". Life in Abruzzo. http://www.lifeinabruzzo.com/abruzzo-annual-weather-forecast/. Retrieved 15 August 2016. ^ a b c "The Region Abruzzo". http://www.italy-schools.com/italy/abruzzo.html. ^ "Region Abruzzo". Immobiliare Caserio resources. http://www.resources.immobiliarecaserio.com/region-abruzzo/. ^ "Parco Nazionale d'Abruzzo (in English)". http://www.parks.it/parco.nazionale.abruzzo/Eindex.php. Retrieved 29 May 2013. ^ a b "Archived copy". Archived from the original on 1 February 2014. https://web.archive.org/web/20140201203055/http://www.bancaditalia.it/pubblicazioni/econo/ecore/2012/analisi_s_r/1215_abruzzo%3Binternal%26action%3D_setlanguage.action?LANGUAGE=en. Retrieved 2014-01-25. ^ "EUROPA Press Releases – Regional GDP per inhabitant in the EU27, GDP per inhabitant in 2006 ranged from 25% of the EU27 average in Nord-Est in Romania to 336% in Inner London". Europa (web portal). 19 February 2009. http://europa.eu/rapid/pressReleasesAction.do?reference=STAT/09/23&format=HTML&aged=0&language=EN&guiLanguage=en. Retrieved 15 September 2011. ^ "Economic and energy framework in 2005". Archived from the original on 13 June 2010. https://web.archive.org/web/20100613112109/http://www.autorita.energia.it/allegati/inglese/annual_report/annual_report_2006.pdf. ^ Helg, Rodolfo; Peri, Giovanni; Viesti, Gianfranco. "Abruzzo and Sicily: Catching up and lagging behind". Archived from the original on 19 February 2014. https://web.archive.org/web/20140219115829/http://www.econstor.eu/bitstream/10419/44799/1/319155617.pdf. Retrieved 15 August 2016. ^ "Abruzzo and Sicily: Catching up and lagging behind, EIB Papers vol. 5, No. 1 (2000)" (PDF). Archived from the original on 27 March 2009. https://web.archive.org/web/20090327082206/http://www.eib.org/attachments/efs/eibpapers/eibpapers_2000_v05_n01/eibpapers_2000_v05_n01_a03_en.pdf. Retrieved 22 April 2010. ^ "Eurostat". Europa (web portal). Archived from the original on 26 January 2010. https://web.archive.org/web/20100126123610/http://circa.europa.eu/irc/dsis/regportraits/info/data/en/itf1_eco.htm. Retrieved 22 May 2009. ^ "Abruzzo". Italian Tourism Official Website. http://www.italia.it/en/discover-italy/abruzzo.html. ^ a b "Eurostat". Europa (web portal). Archived from the original on 1 February 2009. https://web.archive.org/web/20090201175658/http://circa.europa.eu/irc/dsis/regportraits/info/data/en/index.htm. Retrieved 22 May 2009. ^ "Abruzzo International Airport – flights information Pescara, Abruzzo, Italy". Abruzzoairport.com. Archived from the original on 12 March 2013. https://web.archive.org/web/20130312111118/http://www.abruzzoairport.com/default.aspx?lang=en. Retrieved 2013-03-12. ^ "Marina of Pescara". Marinape.com. 2011-01-31. http://www.marinape.com/eng/index.aspx. Retrieved 2013-03-12. ^ "The Perdonanza with images of 1998, 1999 and 2000". http://www.italyheritage.com/magazine/2002_05/f.htm. ^ "IN SULMONA, EASTER DRAMA IN THE PIAZZA". The New York Times. 7 April 1985. https://www.nytimes.com/1985/04/07/travel/in-sulmona-easter-drama-in-the-piazza.html. ^ Delicious Italy Team. "Delicious Italy Easter in Sulmona". http://www.deliciousitaly.com/guide/central-italy-regions/abruzzo-guide/abruzzo-itineraries/item/1063-sulmona.html. ^ Lucio D'Andrea. "Along the Shepherd's Tracks Tratturi and Transumanza". Archived from the original on 5 October 2011. https://web.archive.org/web/20111005050344/http://www.abruzzomoliseheritagesociety.org/TRATTURIeTRANSUMANZA.pdf. ^ "Interamnia World Cup". http://www.interamniaworldcup.com/en/. ^ "This page has been removed". The Guardian. https://www.theguardian.com/world/2014/jan/27/pope-john-paul-ii-blood-stolen-church-italy. ^ "I Borghi più belli d'Italia". http://www.borghitalia.it/?lang=en. ^ "Serenissimi e borbonici insieme per disfare l'Italia". http://www.corriere.it/cultura/speciali/2010/visioni-d-italia/notizie/3civitella-del-tronto-Serenissimi-e-borbonici-insieme-per-disfare-l-Italia_b3bc7456-550c-11df-a414-00144f02aabe.shtml. ^ "Shrine of Saint Gabriele dell'Addolorata – Isola del Gran Sassoo". turismo.provincia.teramo.it. http://turismo.provincia.teramo.it/art-and-culture/churches/shrine-of-saint-gabriele-dell92addolorata-96-isola-del-gran-sasso/?set_language=en. ^ RAIMONDI, Umberto. "Guida turistico-culturale di Giulianova: La città ideale di Giuliantonio Acquaviva – Abruzzo... una regione da vivere e... da scoprire.". http://www.giulianovaweb.it/la-citta-ideale.html. ^ "Movimento dei clienti negli esercizi ricettivi – Dati definitivi". http://www.istat.it/it/archivio/48501. Retrieved 12 August 2012. ^ Kathleen Peddicord. "World's Top 21 Retirement Havens". Live and Invest Overseas. http://www.liveandinvestoverseas.com/read-2013-articles/worlds-top-21-retirement-havens1.html. ^ "Harvard Summer Program in Umbria and Abruzzo, Italy". Archived from the original on 2 February 2014. https://web.archive.org/web/20140202181151/http://archive.summer.harvard.edu/programs/abroad/abruzzo/. ^ "È l'Abruzzo la regione dove si mangia meglio". Bompensa Oleificio e Azienda Agricola. Archived from the original on 3 February 2014. https://web.archive.org/web/20140203151430/http://www.bompensaoliveoil.com/e-labruzzo-la-regione-dove-si-mangia-meglio/. ^ "Abruzzo and Molise Heritage Society". Abruzzomoliseheritagesociety.org. Archived from the original on 9 March 2013. https://web.archive.org/web/20130309041825/http://www.abruzzomoliseheritagesociety.org/cuisine.htm#abruzzo. Retrieved 2013-03-12. ^ "GASTRONOMY, TYPICAL SPECIALTIES OF ABRUZZI CUISINE". Hotel Poseidon Tortoreto. Archived from the original on 12 January 2011. https://web.archive.org/web/20110112034945/http://www.hotelposeidontortoreto.com/en/abruzzi-wine-and-food_31.html. Retrieved 15 August 2016. ^ "Italian Wine Regions – Grapes and Wine Production". WineCountry.it. Archived from the original on 7 January 2004. https://web.archive.org/web/20040107193446/http://winecountry.it/regions/. Retrieved 15 August 2016. ^ "WineNews – THE BEST ITALIAN WINE IS TREBBIANO D'ABRUZZO 2007 BY VALENTINI, THEN BAROLO RESERVE MONPRIVATO CÀ D'MORISSIO 2004 BY MASCARELLO AND SASSICAIA 2009 BY SAN GUIDO ESTATE. THE "BEST ITALIAN WINE AWARDS-THE 50 BEST WINES OF ITALY" - Visualizzazione per stampa". 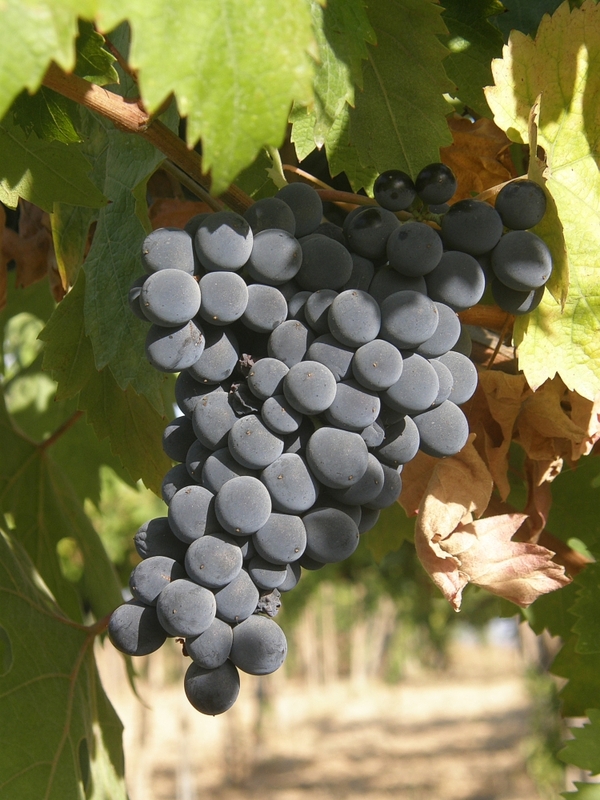 Archived from the original on 10 November 2014. https://web.archive.org/web/20141110154821/http://www.winenews.it/print/the-winenews-corner/28904/the-best-italian-wine-is-trebbiano-dabruzzo-2007-by-valentini-then-barolo-reserve-monprivato-c-dmorissio-2004-by-mascarello-and-sassicaia-2009-by-san-guido-estate-the-best-italian-wine-awards-the-50-best-wines-of-italy. This page uses content from the English language Wikipedia. The original content was at Abruzzo. The list of authors can be seen in the page history. As with this Familypedia wiki, the content of Wikipedia is available under the Creative Commons License.